The following examples show how to use some of the more advanced features of the JMS API: durable subscriptions and transactions. The durablesubscriptionexample example shows how unshared durable subscriptions work. It demonstrates that a durable subscription continues to exist and accumulate messages even when there is no active consumer on it. The example consists of two modules, a durableconsumer application that creates a durable subscription and consumes messages, and an unsubscriber application that enables you to unsubscribe from the durable subscription after you have finished running the durableconsumer application. For information on durable subscriptions, see Creating Durable Subscriptions. The main client, DurableConsumer.java, is under the _tut-install_/examples/jms/durablesubscriptionexample/durableconsumer/ directory. The example uses a connection factory, jms/DurableConnectionFactory, that has a client ID. To send messages to the topic, you run the producer client. In a command window, go to the durableconsumer example. The command output reports the creation of a connector connection pool and a connector resource. After the DurableConsumer client receives the messages, enter q or Q to exit the program. At this point, the client has behaved like any other asynchronous consumer. If a durable subscription did not exist, these messages would be lost, because no consumer on the topic is currently running. However, the durable subscription is still active, and it retains the messages. Enter q or Q to exit the program. After you have finished running the DurableConsumer client, run the unsubscriber example to unsubscribe from the durable subscription. The client reports that it is unsubscribing from the durable subscription. The transactedexample example demonstrates the use of local transactions in a JMS client application. It also demonstrates the use of the request/reply messaging pattern described in Creating Temporary Destinations, although it uses permanent rather than temporary destinations. The example consists of three modules, genericsupplier, retailer, and vendor, which can be found under the tut-install`/examples/jms/transactedexample/` directory. The source code can be found in the src/main/java/javaeetutorial trees for each module. The genericsupplier and retailer modules each contain a single class, genericsupplier/GenericSupplier.java and retailer/Retailer.java, respectively. 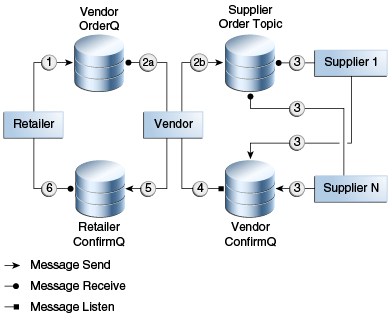 The vendor module is more complex, containing four classes: vendor/Vendor.java, vendor/VendorMessageListener.java, vendor/Order.java, and vendor/SampleUtilities.java. The example shows how to use a queue and a topic in a single transaction as well as how to pass a JMSContext to a message listener’s constructor function. The example represents a highly simplified e-commerce application in which the following actions occur. For simplicity, there are only two suppliers, one for CPUs and one for hard drives. The retailer then places a second order for twice as many computers as in the first order, so these steps are executed twice. Figure 49-1 illustrates these steps. All the messages use the MapMessage message type. Synchronous receives are used for all message reception except when the vendor processes the replies of the suppliers. These replies are processed asynchronously and demonstrate how to use transactions within a message listener. At random intervals, the Vendor client throws an exception to simulate a database problem and cause a rollback. All clients except Retailer use transacted contexts. The example uses three queues named jms/AQueue, jms/BQueue, and jms/CQueue, and one topic named jms/OTopic. You will need four terminal windows to run the clients. Make sure that you start the clients in the correct order.